A few weeks ago, a friend and I took a trip down to the Outer Banks to recapture our youth. 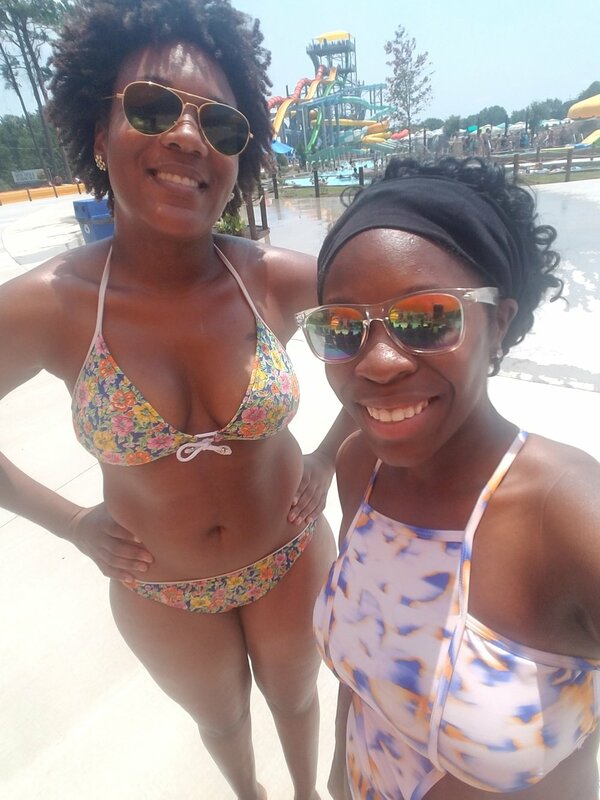 She had not been to a Water park in years so when I told her that I received 2 tickets to visit the new Water park H2OBX, she was down for the ride! After a 1 hour drive from Chesapeake, we wasted no time getting on rides, here are a few of my favorites. The Plank - Cross your arms, keep your head back, count to 3 and wait for the free fall drop. I was terrified of this one, but the minute I leveled out, it turned out to be the most exciting ride of my visit. Dune Runner- If you want a little moral support to go with your thrill experience, this is a great ride! Its similar to the Midnight Marauder but in an open tube instead of closed off. 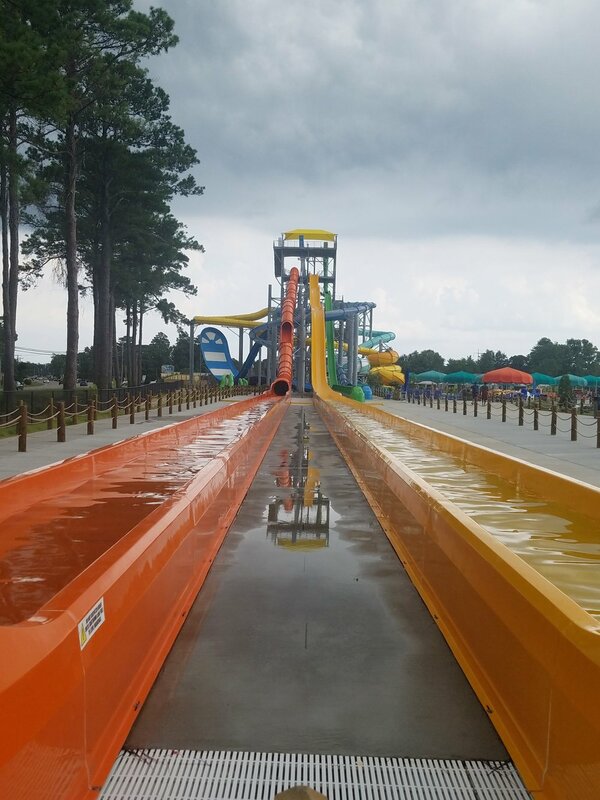 My friend and I rode both, taking turns to be in the front each time. It has plenty of dips and a splash ending, great for those who want excitement with the protection of a inflatable tube. Cat-5 Bay Wave Pool - You can stand at the main entrance and get your feet wet, or go to the deep end and ride the waves. If you close your eyes for a second, you would think you were in the ocean, the waves are big and seem to go forever. Teach's Tides Adventure River - This is where you come to chill. It's your normal lazy river and although a little slower than what I would've hoped for, I plopped myself down on a float and waded down the river for 30 minutes after eating. When in North Carolina, you have to eat BBQ right? 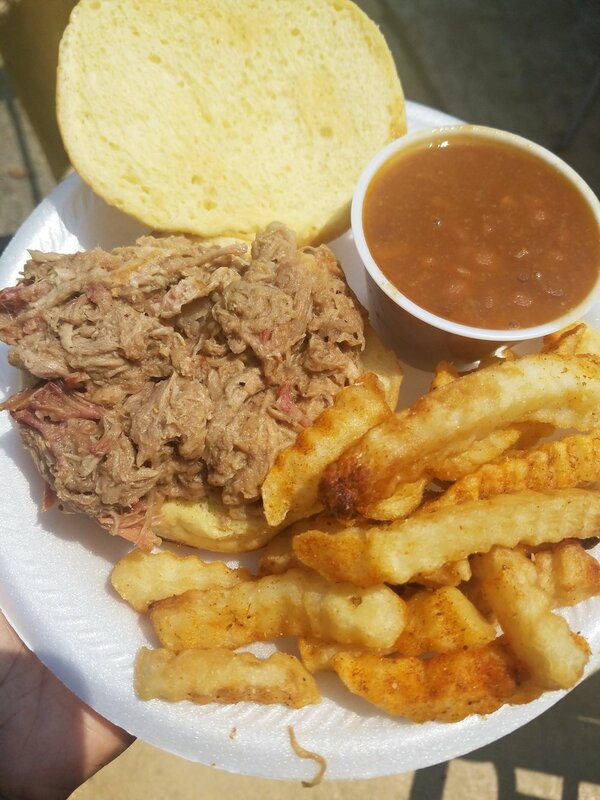 I chose a platter from Heavenly Hawg BBQ with a pulled pork sandwich, a side of fries and baked beans. My personal preference is light on vinegar and barbecue sauce. There was no sauce, but a fair amount of vinegar that gave it a softer consistency than I hoped for. Despite that, the texture of the meat was still tender without being overly mushy. 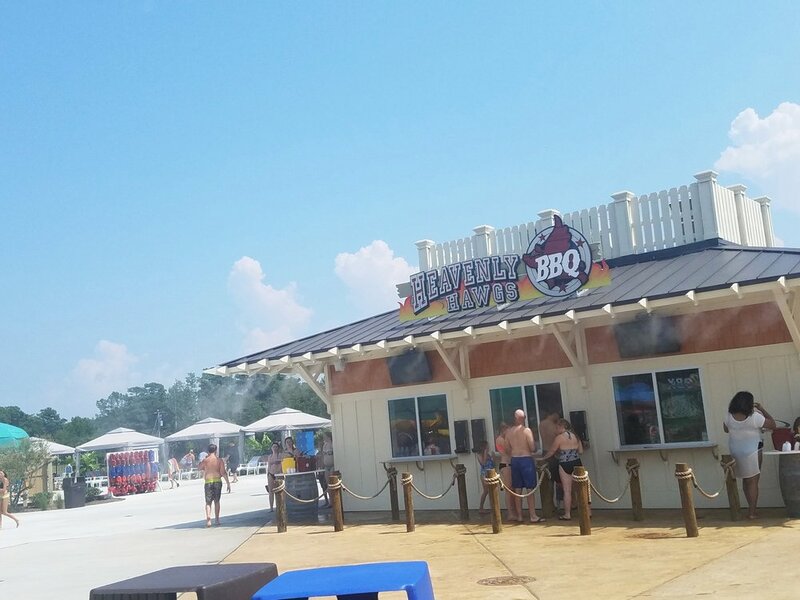 Fun fact: The park has a bar area where you can order a beer, cocktail or wine but with temperatures in the 90's, I stuck to water. There are private cabanas available to rent, and covered area's that are open seating. It took about 20 minutes to find seats that weren't occupied, so I recommend getting their early to find a seat, or renting a locker to place your items. Parking: It's Free, but plan on a long walk to the entrance if you visit on a crowded day. The Tower: This is where all the thrill rides are located. There are 2 sets of stairs, with the majority of the slides being on the same set. I recommend doing the rides that don't require a float first. Weather: Check it before purchasing your ticket. On my visit, there was lightening and the park was shut down, so I unfortunately had to leave. If this happens for longer than 90 minutes, they will issue you a voucher to return within 7 days. Despite not being able to ride all of the rides, my friend and I had a blast. 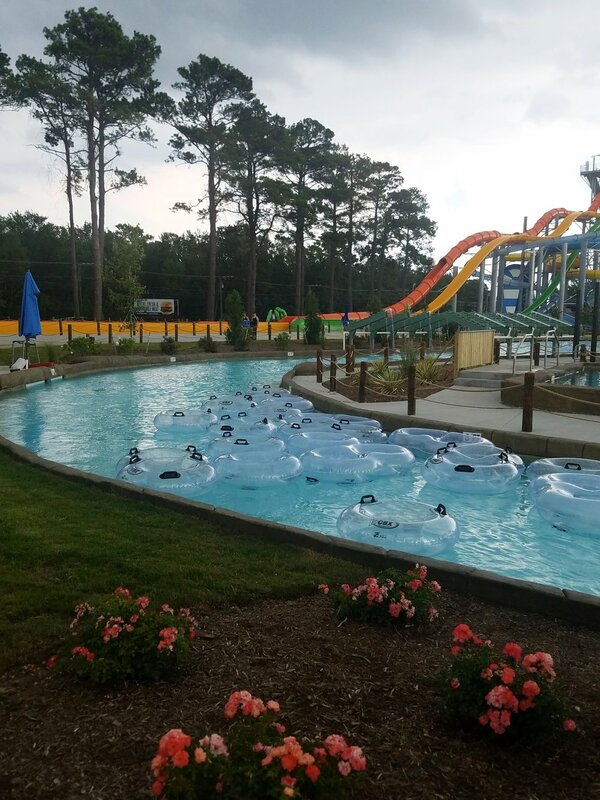 Since there are only a select few water parks in the Hampton Roads area to choose from, which tend to get overcrowded, it is nice that there is another option available during the summer. If you want to visit before the end of the season, which ends September 4th, ticket prices are now only $34.99!